As a blossoming researcher, how are you treating yourself, emotionally and psychologically speaking? What are YOUR tips for staying in a mode and mindset of self-care? The Research Skill Development Framework of Cognitive and Affective Facets can help you learn better how to treat yourself well–even as you are in development. Below I share a post I recently shared in response to a Phinished thread prompting us to post what’s helping us manage as we complete the journey. I hope you find something within it that’s a help! Blessings! And its developers request that this citation information accompanying its sharing: Willison, J. and O’Regan, K. (2007). ‘Commonly known, commonly not known, totally unknown: a framework for students becoming researchers’. Higher Education Research and Development, 26(4), December 2007, pp. 393-409. I never thought about it before encountering that table, but I find it all QUITE helpful regarding self-evaluation: From this info, I now know a little bit BETTER how to do self-evaluation that is PRODUCTIVE (causative of positives and growth!) and less . . . emotional or “self-unkind” and detrimental. Regardless, I am responsible for myself . . . for developing these cognitive and affective facets to my advantage, whether with help from my uni or elsewhere. I hope to be able to be mindful of these and help my students–at least with awareness and direction to help regarding these facts–should I ever advise a thesis-er or dissertater. What are YOUR tips for staying in a mode and mindset of self-care? 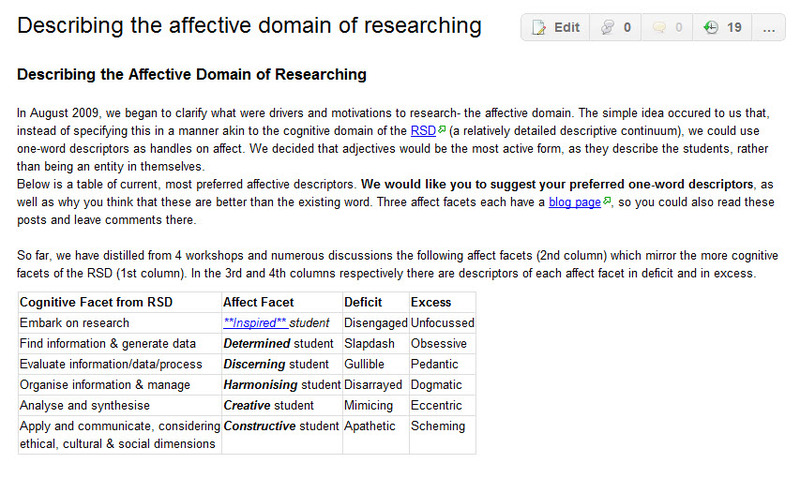 And what are your thoughts about the RSD Framework, either the cognitive facts, the affective facets, or both? Please post away by clicking on the comment bubble icon above this post. This entry was posted in affect, confidence, courage, effectivness, efficiency, emotion, encouragement, goals, inspiration, momentum, perseverance, Research Skill Development, stuck by Z. Sanders. Bookmark the permalink.